The volca series has defined itself by linking classic sound engines of the past with the music of today. The volca fm perpetuates this commitment to making sensible bridges for the best sounds of the past to find a new relevance in modern music-making. If you are a fan of vintage synthesis and the true milestones of innovation that have occurred along the way, you will appreciate the tip of the hat to one of the great innovators of the early 1980s, right down to the user interface. 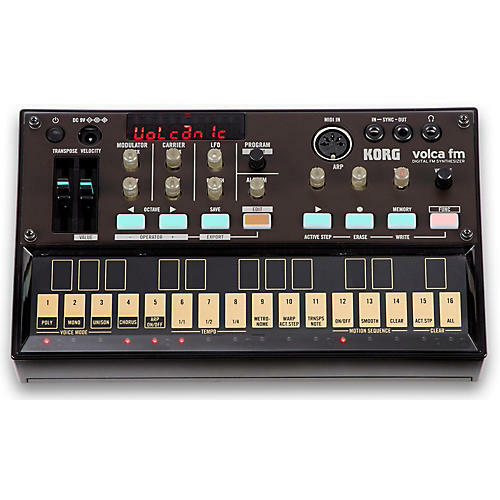 The volca fm makes FM sound editing accessible with the MODULATOR/CARRIER super-easy edit knobs – the knob movements are mapped to multiple parameters for sound changes that are easy to understand. FM enthusiasts can also menu dive into full parameter edits. The volca fm is an ideal solution to the synthesist’s challenge of having a high-quality FM synthesizer in the toolkit, with control elements that make it sparkle in modern musical contexts.